KastKing ® Orcas high performance spinning reels have an attractive red salmon and black color scheme that look fantastic on any spinning rod for saltwater or freshwater fishing. When you are out on the water in the big hunt KastKing® Orcas have no equal. 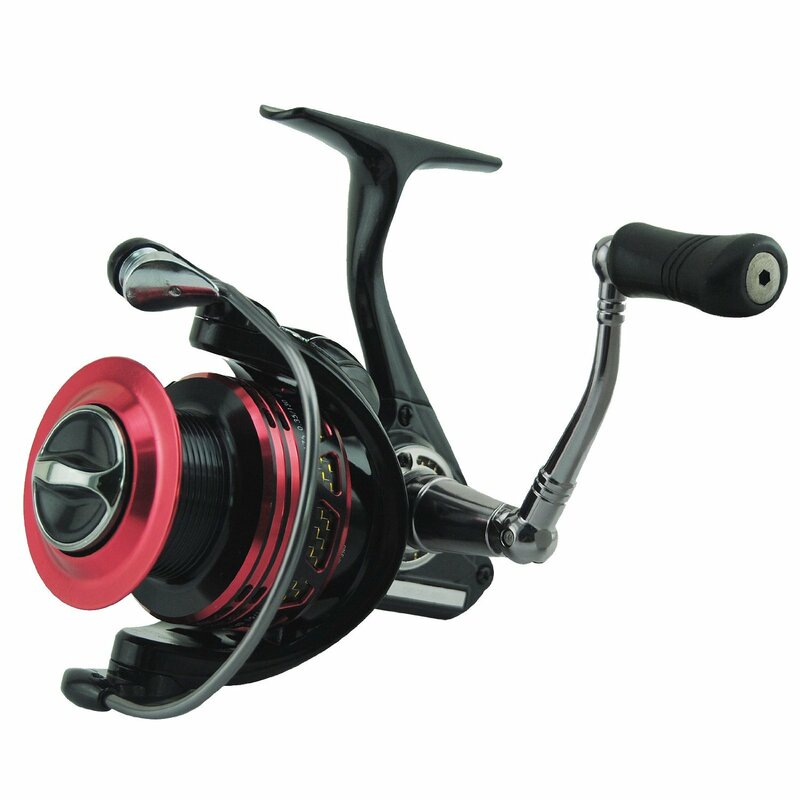 Its unique design includes an aluminum alloy body that's 18% lighter than other brand front drag spinning reels and has 12 + 1 shielded stainless steel bearings, a carbon fiber spool skirt for lighter strength to weight ratio, and a triple-disc carbon fiber drag washers for endlessly smooth pull and awesome stopping power. KastKing® Orcas solid aluminum body is made from a special lightweight aluminum alloy that is 18% lighter than the usual aluminum fishing reel body alloys. Orcas spinning fishing reels are light in weight for their size. Ranging from just under 10 ounces/ 275 gram for the 1000 and less than 12 ounces/ 340 grams for a 4000 - Orcas reels bring a lot to the hunt in a compact package. Orcas 12 + 1 shielded stainless steel ball bearings, stainless steel main shaft, precision machined brass gears and CNC machined aluminum spool and left or right hand handle create a saltwater ready spinning reel. This spinning reel also has a unique carbon fiber spool skirt with a power casting lip that keeps weight down and performance up. KastKing® Orcas front drag spinning reel smooth performing triple disc carbon fiber drag washers deliver a massive knockout hook set with an incredible 26 lbs/12 kg of drag on the 1000 and 2000 series and an enormous 30 lbs/ 14 kg of drag on the 3000 and 4000 size Orcas fishing reels. If you are after a fierce saltwater or freshwater battle offshore or inshore with powerful predators KastKing® Orcas spinning reels deliver more features at a greater value than a Penn, Shimano, Diawa, Okuma or other brand fishing reel. KastKing Orcas high performance reel design and attractive red salmon and black color scheme look fantastic on any spinning rod and makes a perfect spinning reel combo.